Hasbro. Are you listening? Good. Pay attention. Your customers are getting seriously pissed off with games that don’t fit back into the boxes when you have assembled them. Virtually every game you produce these days is like that. So you are damaging your reputation for the sake of adding a few cents to the bottom line. People do not want to assemble and dissemble their games every time they play. This wears out the game. We have the space on our shelves for bigger boxes. So get with the program. See what people are saying about your stuff. And fix it. 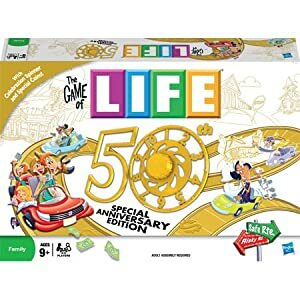 If you own the Game of Life 50th Anniversary board game, please rate it by clicking on the Comments link below the eBay listings.